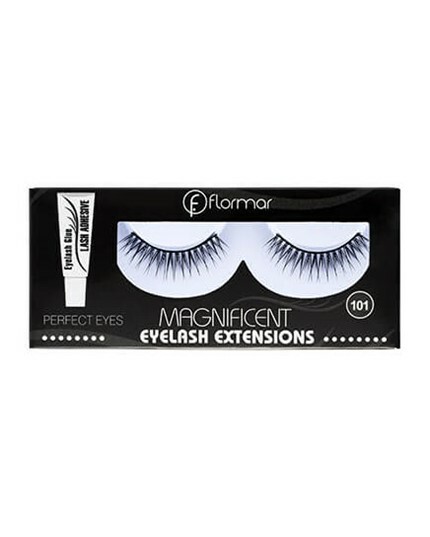 Magnificient Eyelash Extensions is a false eyelash set that will give your eyelashes an intensive effect. With the two different eyelash options, your eye make-up will look even more glamorous than everHold the eyelashes with a pair of tweezers and apply the adhesive along the bottom. After waiting 3 minutes for it to dry, position the eyelashes along your eyelash base, starting from the inner part of your eye and working outwards. After putting the eyelashes on, you can apply a thin line of eyeliner or eyeshadow to blend them with your natural eyelashes. You will achieve even better results with a mascara.